Hey everyone, Farmer B here. We are quickly approaching processing day for our first ever round of pigs here at the farm, so it seemed like a good a time as any to start back at the beginning or our little porcine experiment and fill you in on everything related to our foray into pork. This first part of this hog history will focus on the rationale behind raising pigs here at Callywoods and the initial construction. Part II will touch on the type of pigs we raise, Ossabaw Island Hogs, our daily routines, and what we have learned through the process. Part III will get to the meat of the matter: processing, consumption, and looking into the future as we take our next steps into the second generation of Callywood pork production. 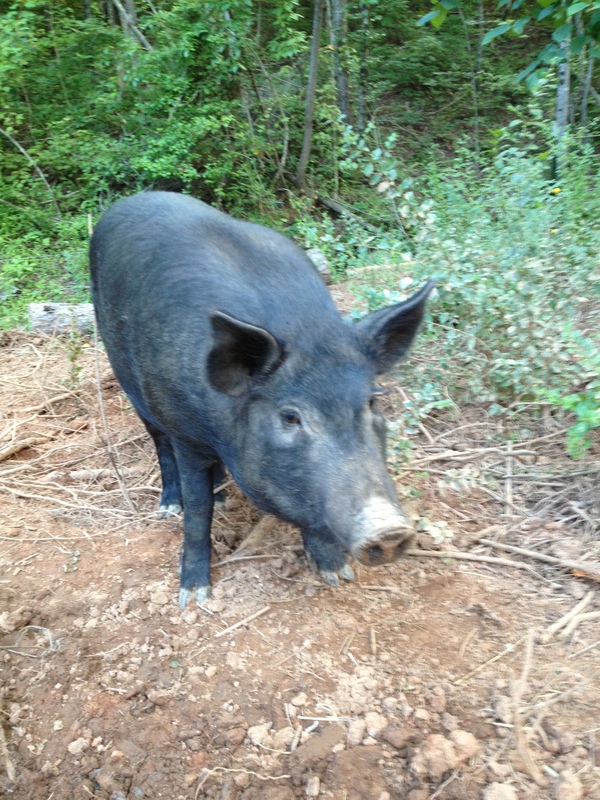 We selected the location on the farm for our pigs between two small creeks where a section of land was naturally bounded in creating a small peninsula that we affectionately call the “Pig Pen” for short. Yep, that’s the kind of clever stuff that keeps us going around here. I opted for electric fencing. It has worked wonderfully. More on the details of our adventure of “training” the pigs to the electric fence in the next part of this discussion, but suffice to say that after a very rocky start to pig fencing, we haven’t had a single issue of note. Our pigs are happy and healthy in their electric enclosure. 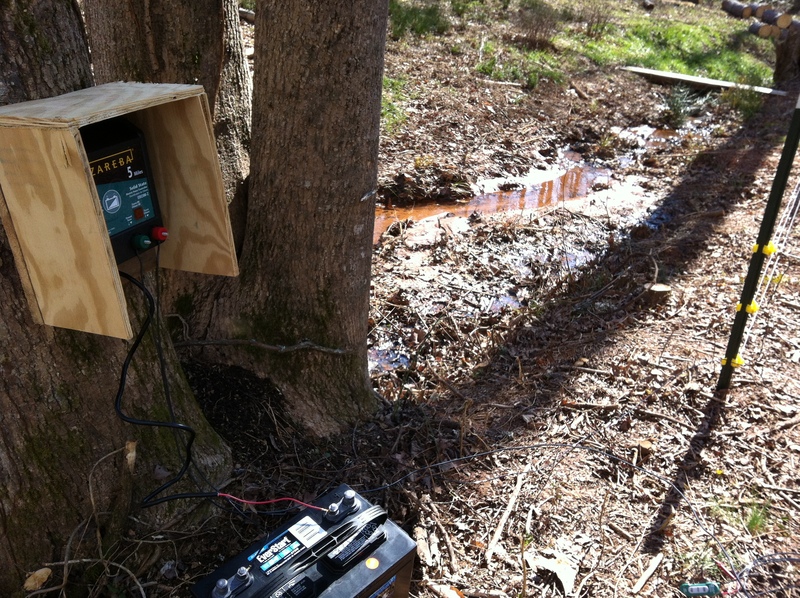 I use a DC powered charger run off a deep cycle marine battery. It lasts 3-4 weeks on a charge depending on how often the pigs decide to bury the lowest of the 4 lines in mud while rooting. 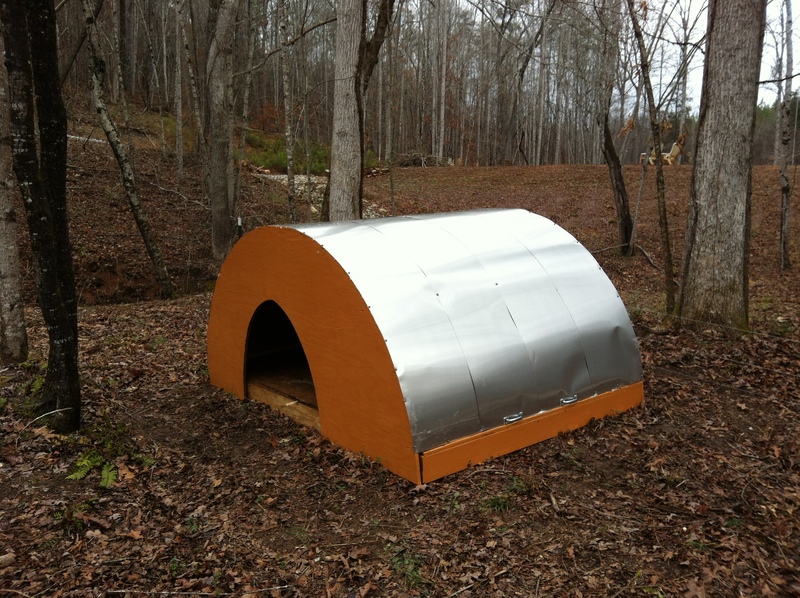 For housing, I utilized a tradition “pig ark” design that is more popular in Europe, especially in the UK. A separate floor and roof section make for easy cleaning and somewhat easier moving when need be. 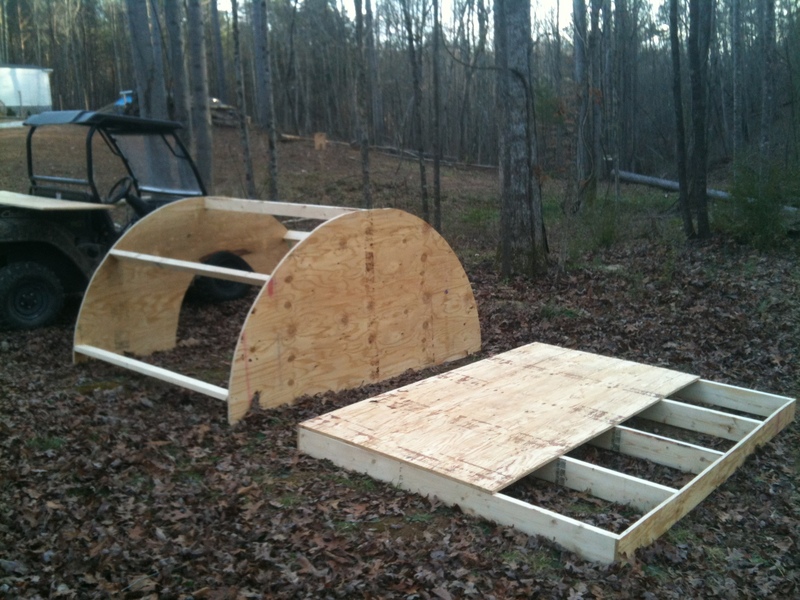 The roof fits directly over the floor for a seamless pig house! 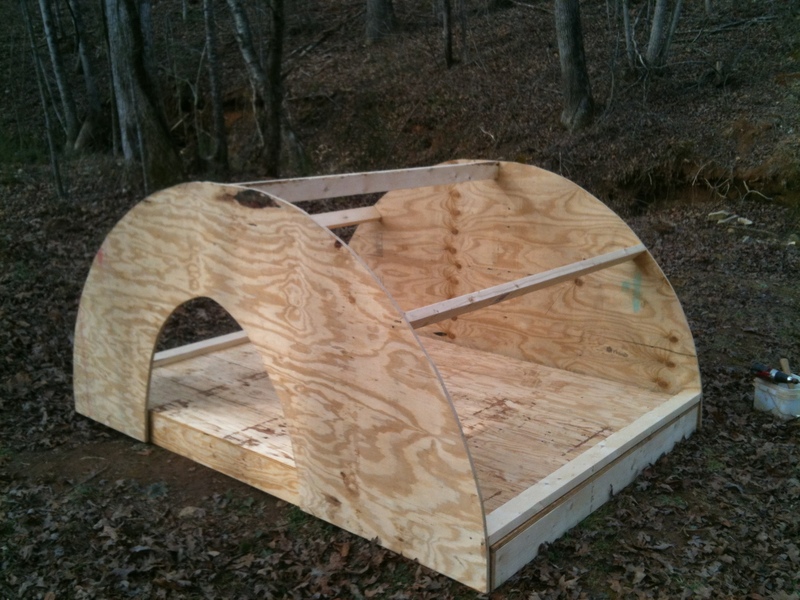 This particular 6’x8′ design is said to be ideal for 3-4 adult hogs or a mother and her litter of piglets. So far I have no reason to disagree with that. Our 3 adult pigs have plenty of room in the ark with ample wiggle room. 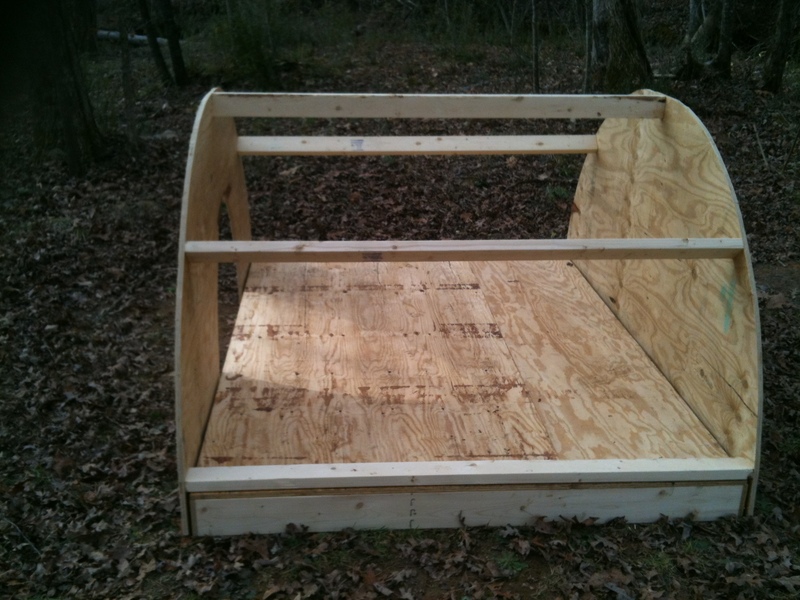 I used heavy duty flashing for the roof material with waterproof screws/washers to keep things high and dry. It’s not as ideal as galvanized or aluminum would have been, but that’s very difficult and expensive to have set to this specific of a curved roofline, so I did what we do best around the farm and improvised! 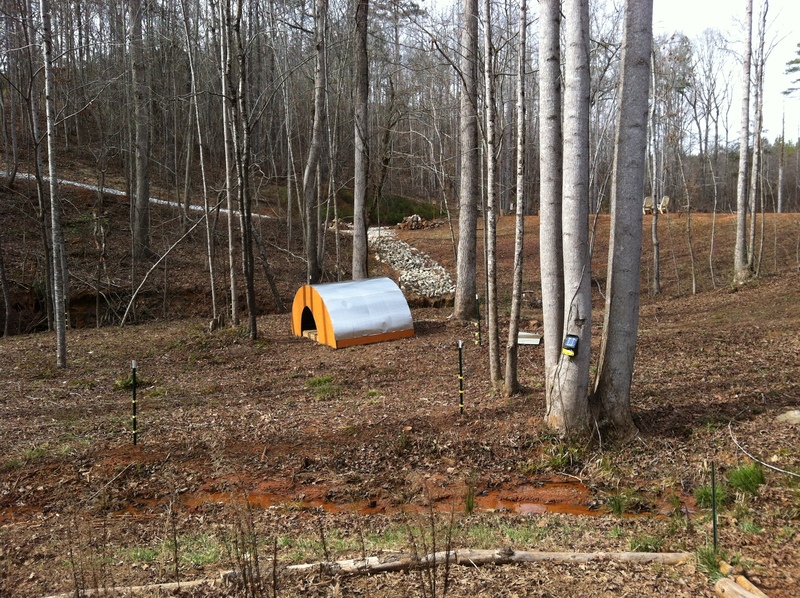 Here is the final look at the Pig Ark in its home in the Pig Pen, surrounded by the electric fence (notice how wonderfully low profile and aesthetically simple the electric fence is). You can see one small creek in the foreground and can picture the other creek behind coming from the pond dam in the background. All that’s left is to supply our new pig home with little porkers! Stay tuned for Part II in this discussion when we learn about Ossabaw Island Hogs, bring our new piglets home, see them promptly escape and then return after a very stressful week on the farm, learn about their routine, and even see the pigs teach their naive farmers a thing or two along the way. This entry was posted in farm, Pigs, Uncategorized and tagged animals, farm, farm construction, farm life, farmer B, livestock, pigs, pork by callywoodfarms. Bookmark the permalink. We have been considering getting a few pigs, helpful information.